Red Rock Nevada climbing guidebook. Detailed route topo of sport climbing, trad climbing and aid climbing. The definitive climbing guidebook for The Red Rock Canyon National Conservation Area. 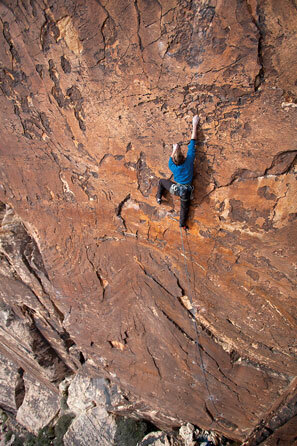 The best winter climbing is located at Red Rocks Las Vegas, Nevada. This is a comprehensive guide to the rock climbs found in Red Rock Canyon National Conservation Area, twenty miles to the west of the famous Las Vegas Strip in Southern Nevada. Red Rocks offers the climber everything from sport routes to big aid walls and long free routes. The reliable weather, beautiful surroundings and great climbing make Red Rocks one of North America's best and most popular destinations during the fall, winter, and spring. This book provides detailed information on over 2300 rock climbs, using full written descriptions, maps, topos and photodiagrams. This new edition includes over 400 previously unpublished routes. Notable recent developments include the addition of a large number of entry-level and moderate sport routes in the Calico Hills; it is probably true to say that Red Rocks now has one of the biggest collections of such climbs in the country. At the other end of the difficulty spectrum, the free ascents of old, big-wall aid climbs in the canyons has resulted in the addition of a batch of fantastic long, free routes. One of the most notable developments in recent years has been the emergence of Red Rocks as a world class bouldering area. All the bouldering is documented in Tom Moulins’ superb guidebook, "Southern Nevada Bouldering". Mountain Skills offers guided trips to the best rock climbing destinations in Las Vegas, Nevada, Taos and Santa Fe, New Mexico, Thailand, New York, and Mexico. If the routes in the photographs throughout this book seem unfamiliar, that’s because I have made a deliberate attempt to shoot new and/or obscure routes. In order to save some space, the updated history of climbing in Red Rocks, as well as the historical essays that appeared in the previous edition have now been moved to the website. In the next few years the BLM is going to be making a series of improvements to the basic infrastructure of Red Rocks. This is going to include expansion of the existing parking areas and possibly the addition of several new ones. Also, it seems likely that there is going to be some sort of return option from the Sandstone Quarry parking area, either making the existing road to that point two way or building an entirely new road back to the Visitor Center. It is worth keeping track of these developments as they will have an effect on some of the information in this book. Covers 2,300 rock climbs, using full written descriptions, maps, topos and photodiagrams.